Lofty Dogs offers one-of-a-kind dog walking service to dog owners of the Twin Cities. 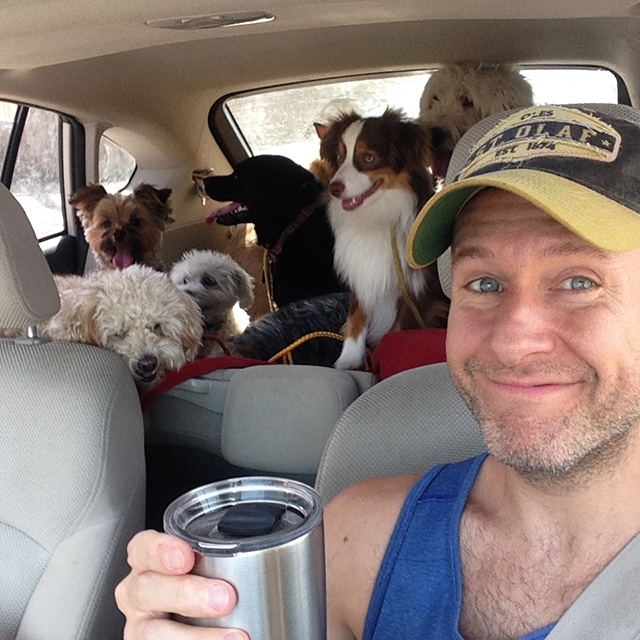 In the human world, he’s known as Mike Meyer, but in the dog world, he’s Daddy. Locals might recognize him walking around the parks, making his way through the streets of the city, collecting a new dog at each apartment he passes. With ten dogs in tow, he can be found gleefully leading his puppy posse along the river, rain or shine. Mike Meyer is many things, but above all he’s an animal lover. After working for a dog walking business in Minneapolis for three years, Meyer had friends in St. Paul reach out to him asking if he knew of anyone with a similar service in St. Paul. Though no one came to mind, Meyer decided that he would soon be the only one who would come to mind. And Lofty Dogs was born. Meyer came up with the name for his company based on two ideas. First, Meyer wanted his company to primarily be for people in communal housing, such as apartments, condos, and—you guessed it—lofts. Second, he wanted the name to represent what his company truly is, which is far more than a dog walking service. “We work to achieve a higher level of behavior for the dogs. We don’t just walk them, but we spend a lot of time training them, too. Our goal is to always aim higher, to be lofty,” Meyer says. Before Lofty Dogs, Meyer worked in nonprofits, for-profits, and large corporations, which he quickly discovered were not for him. In search of a job that would allow him to get exercise, be outdoors, and spend time helping people and working with animals, Lofty Dogs was calling. Meyer says he’s been an animal lover his entire life, and not only is he drawn to animals, but animals are also drawn to him. In particular, Meyer especially enjoys spending time around dogs because of their brilliance and unconditional love. “They really are all about unconditional love, which is such a ‘lofty’ goal for all of us as human beings. We can learn from dogs about how to take joy in literally every single thing in life. That’s the life I want to create for myself,” he says. Lofty Dogs is unique from other dog walking services because it truly goes far beyond walking dogs. Meyer says that when he trains new employees, he has them really get to know each dog, so the dogs know who and what to expect every day. Other than maintaining a happy, clean, and safe environment for the dogs, Meyer says he runs his business on the idea of a winning equation for everyone involved—the five wins: clients, dogs, the apartment buildings, fans on Facebook and Instagram, and the employees. 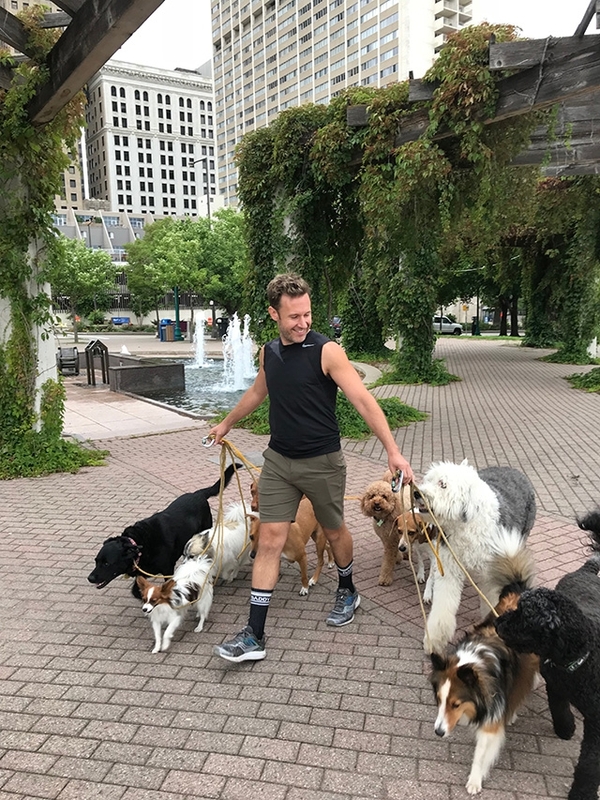 Though Lofty Dogs doesn’t have an extremely prominent GLBT clientele, Meyer says the majority of Lofty Dogs’ Facebook and Instagram fans are of the GLBT community. He says he’s also always looking for more GLBT clients and welcomes anyone to join. As a gay business owner himself, Meyer says he encourages everyone to find a balance in their lives where they feel comfortable and confident. He says the best place to be is balanced in the middle ground because it allows you to get the best perspective and really understand both sides of things. As Daddy of the dogs struts his way through the cities, he’s just an ordinary guy with his hands, er, very full. But to Meyer, he’s living the dream. For more information about Lofty Dogs, visit their website at loftydogs.com.